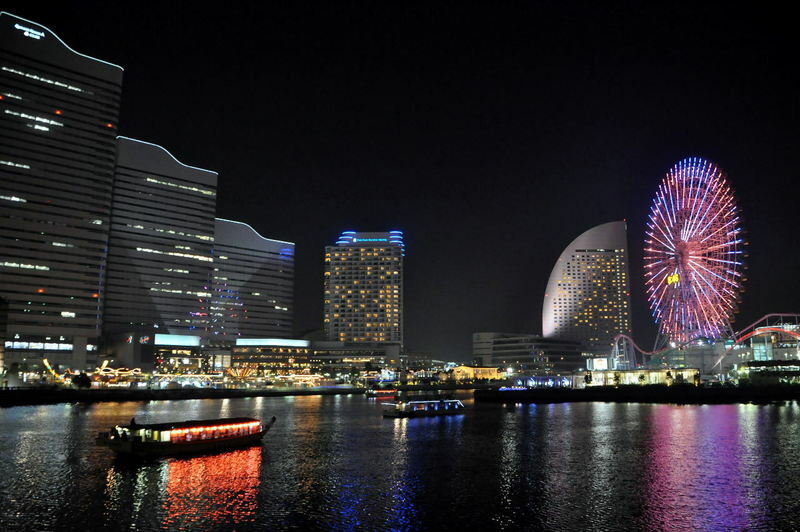 Minato mirai 21, whose number 21 indicates the aspiration to the twenty-first century (to the future) of designers, is a hyper-modern waterfront area of Yokohama, whose construction began in 1983. Before the area was occupied by various port activities and shipyards. 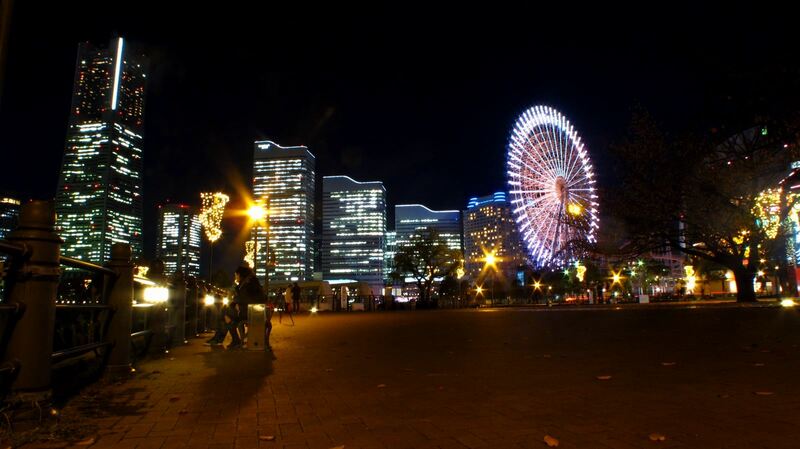 This is the most famous and spectacular area of Yokohama, with many leisure and shopping places. It is a popular place among couples because of the incredible atmosphere, especially after sunset, you walk surrounded by the sea, boats and the lights of the skyscrapers. The Landmark Tower is the tallest skyscraper in Japan (296 m). On the 69th floor of the building there is a 360 degrees observation deck which is reached in just 40 seconds by the second fastest elevator in the world (45 km/h), and where there is also a gift shop and a cafe. Open daily 10-21 (until 22 on saturdays). 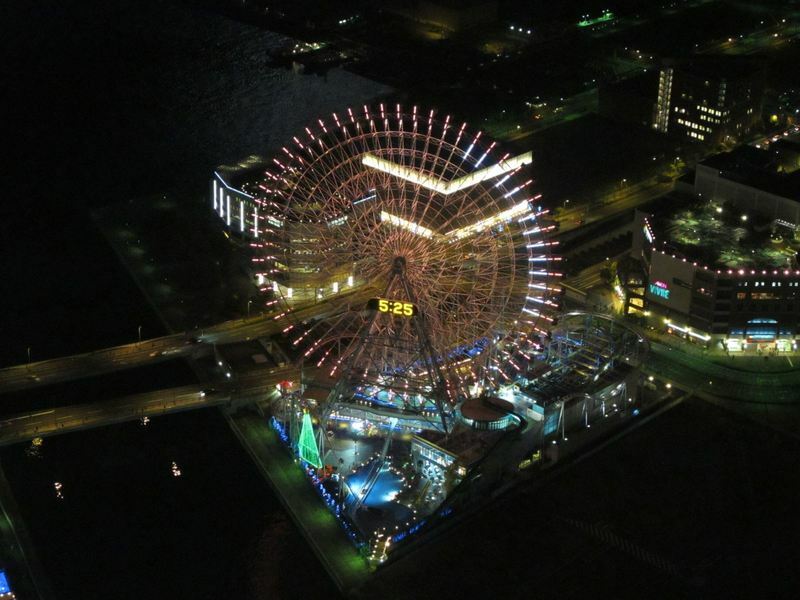 The fare to go up is 1000 yen and I think it is worth it, because there aren't free panoramic observatories in Yokohama (differently from Tokyo), but mainly because it is one of the most spectacular views I've ever seen, especially at night. On the 68th floor there are several luxury restaurants with panoramic view. 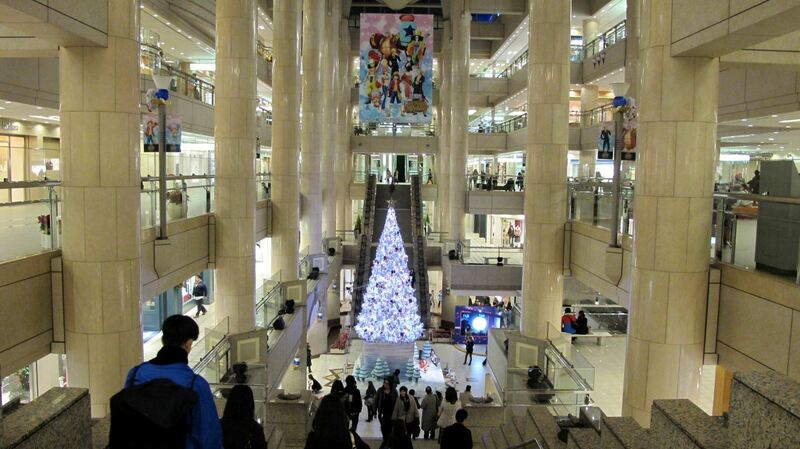 At the foot of the Landmark Tower there is an elegant 5-floors mall called Landmark Plaza. Just in front of it there is another equally prestigious shopping center, the Queen's Square. 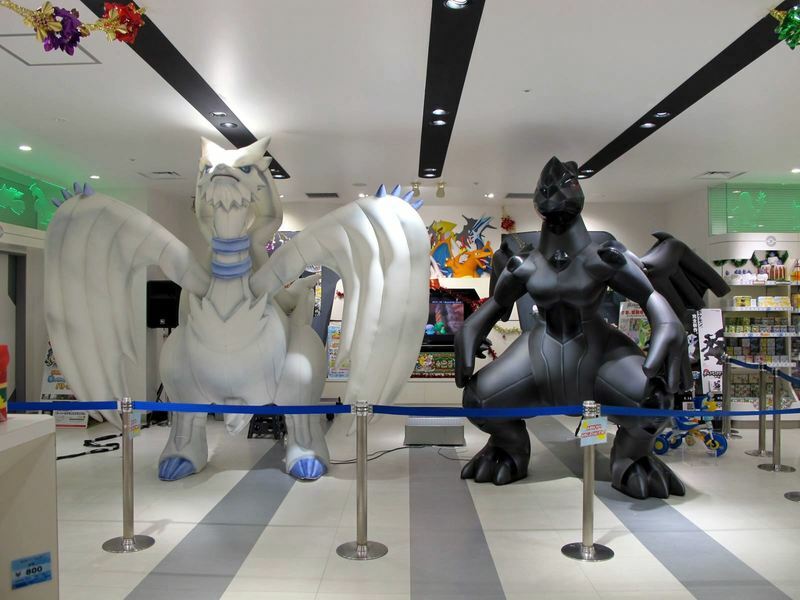 I recommend two particular shops to fans of manga and things like that on the 4th floor of Landmark Plaza a little Jump store and a big Pokemon Center. World Porters is another shopping center in a 6-floor modern building with about 170 shops, it is located in the artificial islet of Minato Mirai (Shinko). Each floor is specialized in a "kind" of stores: the first floor is dedicated to food, with various cafes and restaurants, the 2nd and 3rd floor to fashion, sports and hobbies, the 4th to furnishings.On the 5th floor there is a cinema with 8 screens, an amusement arcade and some other weird things like places where they predict your future. On the rooftop there is a beautiful outdoor miniature golf course, I don't suggest you to go without at least one who speaks japanese. The shops close at 21:00, the restaurants at 23:00, the cinema at midnight, the miniature golf course at 18:00. Another major shopping center located in the east of the artificial islet of Minato Mirai (Shinko). The center is divided into two buildings with an unusual architecture to be in Japan, In fact they're old restored port buildings, something rare in a country where they continually demolish and rebuild. Between the two buildings there is a large square which often hosts various events. I particularly mention, during winter (around december, january and february), the installation of a very nice ice rink that you can see in this video. A small amusement park surrounded by the sea and skyscrapers that make the atmosphere amazing. The most famous attraction is undoubtedly the ferris wheel called Cosmo Clock 21, 112 meters high and with a giant clock in the center visible from the entire area. A full turn takes about 15 minutes and costs 700 yen, it is popular among couples. Most of the other attractions costs between 500 and 600 yen. -Cup Noodles Museum (closed on thursdays, opening hours 10-18, admission fee 500 yen), dedicated to the famous instant ramen and its inventor, Momofuku Ando. The area is perfect if you decide to stay in Yokohama, there are also a lot of hotels, unfortunately they are mostly very expensive luxury hotel, with rooms with spectacular views. For example the Intercontinental Grand hotel, the Pan Pacific hotel, the Royal Park hotel (located on the upper floors of the Landmark Tower). Two hotels with much more affordable prices are the Navios hotel with rooms from 8000 yen per night, and the Sakuragicho Washington hotel, in the price list rooms start from 9500 yen per night, but you can often find cheaper prices in websites like expedia or lastminute.com. I personally booked a semi-double room with bay view paying 8000 yen and the standard single cost 6000 yen. In the various shopping malls in the area there are dozens of restaurants, I don't know what to suggest. If you can speak japanese or have some japanese friend who can help you, and you are interested, you can visit this website for lunch or dinner in one of the many restaurant-boats sailing in the bay. 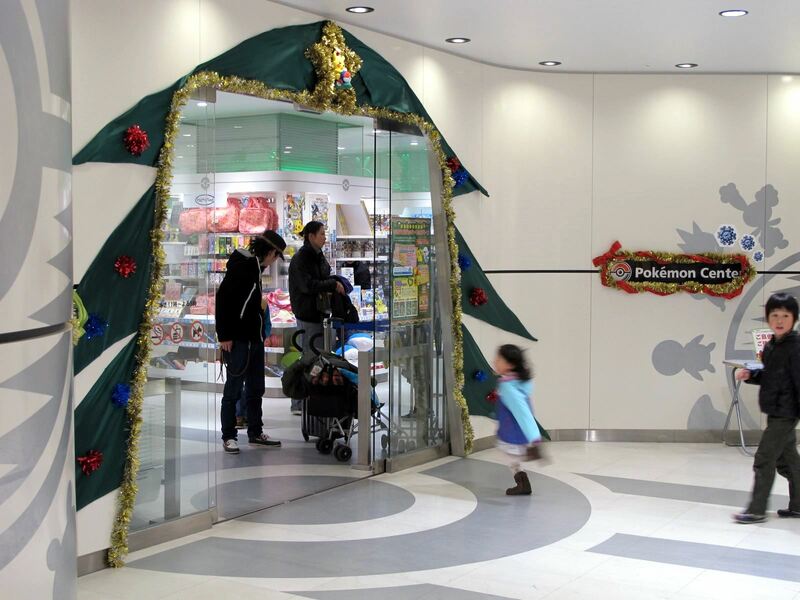 -Sakuragicho station, served by the Blue line of municipal subway and by the JR Negishi line. If you can (for example if you come from Kannai or Yokohama station) always choose the JR Negishi line becouse it is cheaper, the fare is 130 yen while the subway fare is 200 yen. -Minato Mirai station, this station is located just inside the Queen's Square mall, and it is served by the Minatomirai line. You can reach this area on foot both from Chinatown and from Yokohama station area (it takes about about twenty minutes).